You can use an Excel worksheet scroll bar to automatically adjust a number in a worksheet cell. For example, users could slide the bar to see how revenue is affected by rising gas prices. 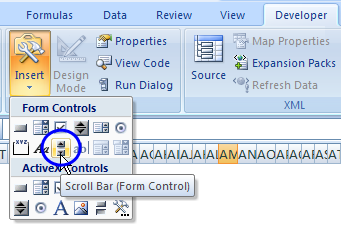 An Excel scroll bar is easy to use, and can be very helpful in a dashboard or data entry sheet. Then, colour the cells (use matching fill colour and font colour), to create a completed picture. In the screen shot below, I've created a Christmas tree, with a star on top, lights and tinsel, and gifts beneath the tree. To make it easier to select specific parts of the picture, you can create named ranges. In the sample Christmas tree workbook several named ranges were created, including one for each tree light colour, each gift, and the star. After you create the named ranges, you can quickly go to a range by selecting it in the Name Box drop down list. After you select a range, you'll be able to format it, or enter numbers in all the cells. The completed picture includes several items that will be hidden when the workbook is opened. For example, the star is not on top of the tree, and the gifts are not beneath the tree. Each hidden object will be revealed when the scroll bar reaches the number typed in its worksheet cell. Type a number in each tree light cell, starting with 1 in cell F32, and ending with 30 in cell P12. The font is black in the screen shot below, so you can see the typed numbers near the top of the tree. Leave a gap between the string numbers, so there's a bit of time between their appearance. The string numbers in this example are 32, 35, 38, 42 and 45. Type the same number in each cell for the Star, so the entire star appears at the same time. The star number in this example is 48, so it appears slightly after the last tinsel string. 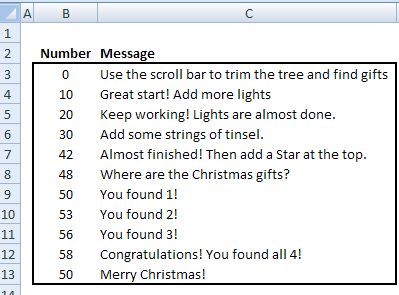 Type the same number in each cell for each gift, so each gift appears separately. 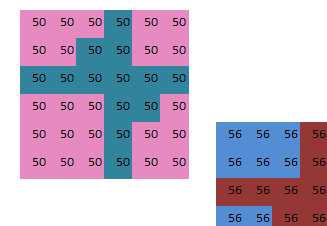 The gift number in this example are 50, 53, 56 and 58. A text box on the worksheet will display a message, based on the current number selected in the scroll bar. On a different worksheet, create a lookup table for these message. In the first column, type a number, to indicate when the message should appear. The first number should be zero, and that message will be visible when the workbook opens, and the scroll bar hasn't been adjusted. In the second column, type a short message for key points in the process. Name the list (not including the headings) as MsgList. Next, you'll add a scroll bar to the worksheet, to control the messages and hidden items. On the worksheet, drag a rectangle shape, to create the horizontal scroll bar. For the Cell Link, enter $G$3. This cell will be hidden behind the scroll bar, where users won't accidentally delete it. Click OK, to close the Format Control window. Next, you'll create a VLookup formula to find the message that matches the scroll bar setting. Note: The fourth argument is set to TRUE, so the result will be an approximate match. 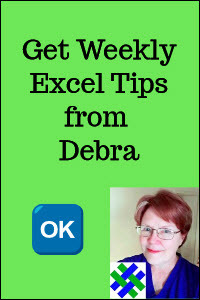 Next, a text box is added to the worksheet, to display the message from VLookup formula. Move the scroll bar, if it is covering cell C3. 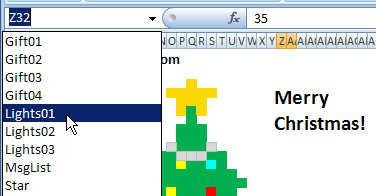 On the Excel Ribbon, click the Insert tab. 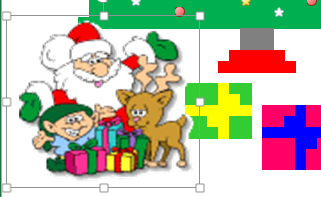 On the worksheet, drag a rectangle shape at the top right of the picture, to create a text box. Click on the border of the text box, to select the shape -- after clicking, you should not see the cursor flashing inside the text box. 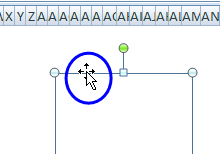 Click in the Formula Bar and type an equal sign. 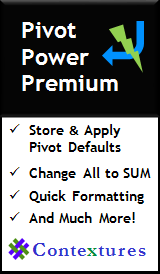 Format the text box with no border, no fill, and a large, bold font. The text box will display the message for the number currently selected in the scroll bar (probably zero). Click the scroll bar buttons, up or down, to see the message change. If you drag the scroll bar box, the message won't change until you release the slider. 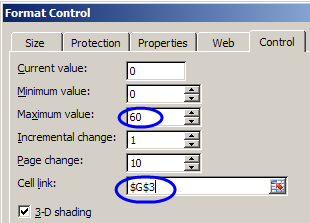 The final step is to add conditional formatting to the hidden objects, so they appear when the scroll bar reaches a specific number. 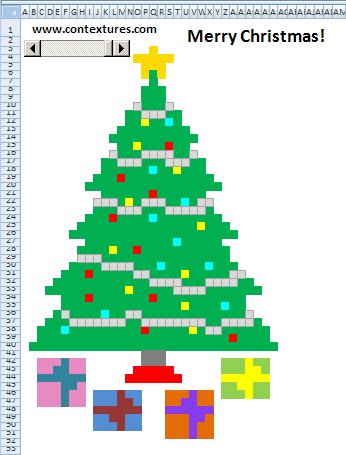 The star and the gifts will be formatted as white fill and font, until the scroll bar reaches their number. 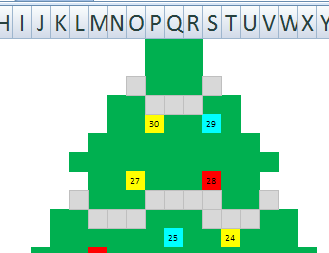 The tree lights and tinsel strings will be formatted as green fill and font, until the scroll bar reaches their number. Click Format, and format the cells with White fill, White font and no border. After everything is set up, you can test the scroll bar. Move the scroll bar, so it covers cells C3 and G3. Click the up or down button on the scroll bar, to see the decorations and gifts appear. Click the down button, to hide the decorations and gifts. The tree will go from plain to decorated, and back to plain. 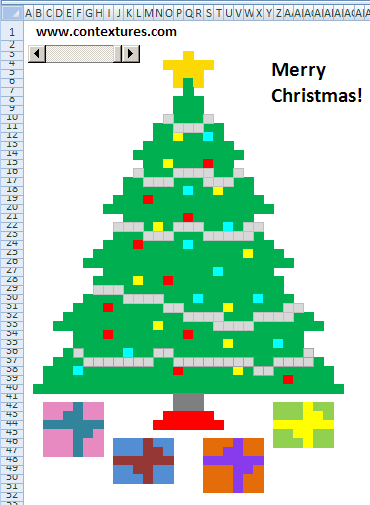 Christmas 2010 version: To see how the Excel Scroll Bar Christmas Tree file works, you can download the Excel Scroll Bar sample file. It is in xlsx format, zipped, and does NOT contain any macros. 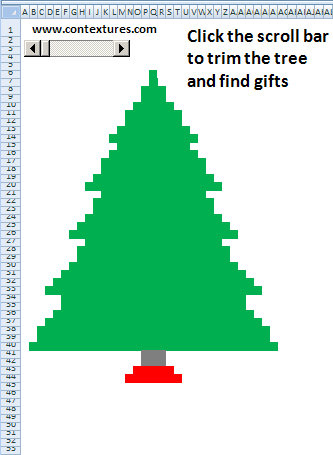 Christmas 2017 version: This tree is similar to the 2010 version, with a few new features, like the Santa picture, shown below. It has a Spin button, instead of a Scroll bar, and a check box to change the light colours. Click here to download the 2017 Christmas Tree sample file. It is in xlsx format, zipped, and does NOT contain any macros. To see the Christmas 2010 version of the file in action, you watch this short video.